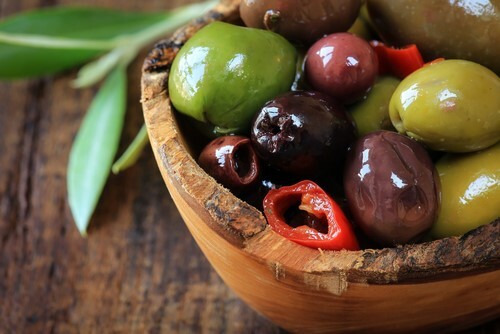 Did you know that there are at least 600 varieties of olives in the world? That seems like a huge number when most people we’ve met are only aware of two, green and black… straight from a can… Oy! Olives are too bitter to be eaten right off the tree and must be cured to reduce their intrinsic bitterness. Many times people assume that an olive’s color separates it from another species. However, that is not altogether correct. Throughout the stages of the olive fruits growth it changes colors. Olives can be picked at various stages of their maturing process, with each stage producing a different flavor/color combination. For example… at the beginning of a harvest, when the olives are green, these fruits will taste differently from olives picked from that same tree later in the season—by this time they have turned red or purple. The riper the fruit, the darker it becomes in color. FUN FACT: First eye shadow was created in Ancient Greece by mixing ground charcoal with olive oil. While the flavor of a green olive is nutty and the fruit is firm, the blacker olives have a more shriveled appearance, with a rich, acquired taste. Another key aspect that affects flavor is how an olive is produced. 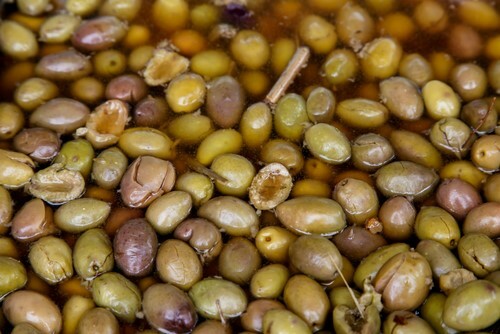 All olives must go through a fermentation process—called curing— to be eaten. This process also has an impact on the taste and texture of the fruit. There are five main ways to cure an olive. SeriousEats.com has excellent information on the olive fruit, but we found this information on curing to be particularly informative. 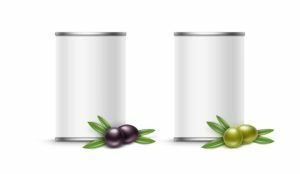 “Brine-curing: Fully ripened, dark purple or black olives are gradually fermented in brine (i.e. salt water). This takes major time—up to a year. Brine-cured olives are often sweet and full of depth, since the brine acts to intensify the fruit’s natural flavors. Water-curing: Soaking, rinsing in plain water, and repeating, and repeating again…this method is the slowest of all, and consequently quite rare. Some producers begin their curing process in a water bath, and then move their olives into a seasoned brine. Dry-curing: These olives get packed in salt for a month or longer. The salt pulls the moisture and bitterness from the olives. The salt is then removed, and sometimes the olives get bathed in olive oil to keep them juicy and plump. Dry-cured olives have a deeply concentrated flavor, and a wrinkly, prune-like appearance. Oil-cured olives are dry-cured olives that get macerated, or softened, in oil for several months. Lye-curing: Large commercial olive producers make use of this time and cost-effective method. Invented in Spain, the process calls for immersing raw olives in vats of alkaline lye solution. 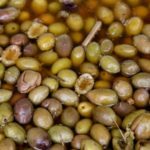 Unfortunately, the fast-acting lye is also detrimental to the olive’s flavor, leaving behind a bit of a chemical aftertaste and a sad, bland olive. Hydroxytyrosol, an olive phytonutrient that has long been linked to cancer prevention, is now regarded as having the potential to help us prevent bone loss as well. Did you know that those infamous black olives we were speaking about earlier are actually picked green? They are then pumped with oxygen in order to turn them black—giving them the appearance of ripened fruit. This is just another reason why we believe it is important to know where our food comes from, and how it is produced. When food is produced using natural processes like fermentation or other age-old methods, the food is still in its most healthy form, making it easier for our bodies to digest, while at the same time enhancing the nutritional value of the product. 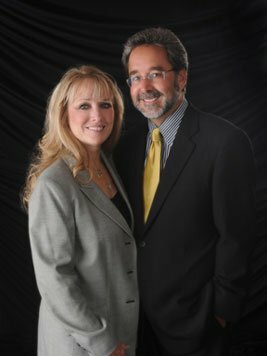 If you think this information is interesting, we have only just begun to share about the wonders of the olive tree, and the myriad of products that come from it. Oh, and if you’re wondering what our FAVORITE olive is? Well, to put it simply… we don’t believe in playing favorites!